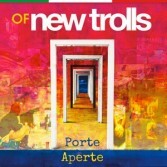 LIMITED EDITION n. 500 copies of which 250 autographed by GIANNI BELLENO and NICO DI PALO the two historical founders of the New Trolls. The OF New Trolls present a powerful piece, where the melody and the vocal mixture, carry the listener in a very precise direction, to "Open Doors". The artistic maturation of Nico and Gianni emerges with clarity, in particularly refined sounds, complemented by an elegant and carefully written text, by a compositional, instinctive and personal pen, which enhances the qualities of the band. A clear and refined vision of a difficult moment with ".. this Italy that has not been walking for some time", but enters the sounds and draws real atmospheres, from the intense cold. A song that goes in the saddest angles, but with an eye of hope, to the society that watches the time that runs away and where the music makes each note shine. The entrance lends ear to a beating heart, supported by a riff as meaningful enough, Gianni to show off his singing part as a soloist with elegance of balance, where the cohesion and variety of accents of the group is always exemplary, while low and keyboards complete a welcoming melody, at the same time, simple and tortuous, romantic and aggressive. Even at the first listening, the whole elaborates, under many points of view, emotional feelings, which express the awareness of one's own existence and not only in musical language.